After the disastrous experiment that was "Victim Of Love" and its disco meddling, Elton John returned to a certain amount of normality with this album. Still part-estranged from Bernie Taupin for a while, (he contributed three songs) Gary Osborne was still his main lyricist. It is not a bad album though, in places. It is notable, though, that the Taupin songs are three of the best ones - "Chasing The Crown", "Two Rooms At The End Of The World" and "White Lady, White Powder". We were heading into the eighties, though, and the worst aspects of that decade were beginning to make themselves known via drum machines, layered synthesised keyboards and the like. "A Single Man", from 1978, for example, had none of that sort of thing. It had the band playing "proper" rock, still. "Chasing The Crown" is a thumping, bassy rocker to open with which was relief after the previous album. He was playing piano again, too, which he hadn't done on that previous one. The beguiling, melodic "Little Jeannie" was a single and a most fetching one it was too, with an addictive hook and Elton on fine vocal form. There are slight hints of "Daniel" on the song, just every now and then. My personal favourite on the album is is the big, dramatic ballad "Sartorial Eloquence" which has an excellent build up to a very catchy chorus. 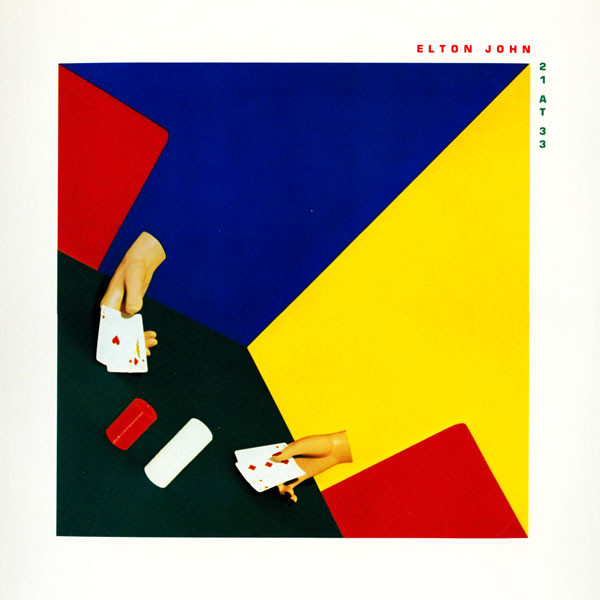 "Two Rooms At The End Of The World" is a riffy, rocking number while "White Lady, White Powder" is an exhilarating, singalong ode to cocaine from an Elton who was getting increasingly dependent. It was a song addressing his problem, but almost admitting there wasn't much he could do about it. The desperate plea of "Dear God" comes next, maybe quite appropriately. "Never Gonna Fall In Love" is an appealing ballad and "Take Me Back" is an upbeat, country-ish number with Elton adopting that strange, twangy voice he does on occasions and a fiddle break in the middle. "Give Me The Love" is a slightly dull but perfectly pleasant closer, albeit with some nice orchestrated backing, to what was actually quite a short album. It certainly wasn't a special album in any way, it had its high points, but it is not one out of Elton's many albums, all of which I own, that I return to very often.